Crouched in the snow, deep in a southeastern Kentucky holler last week, I sat glassing the opposite hillside for anything that resembled an elk. Conditions were ideal to say the least. Single digit temps, a fresh blanket of snow and idle time are the key ingredients to my kind of hunt. Or so we thought. It had been three days of the same routine. I was fortunate to tag along with a friend who had caught lightning in a bottle and drawn a coveted Kentucky cow tag, I was thrilled just to be the spotter and hopefully pack mule on an elk hunt so close to home. It was the absolute perfect way to wrap up a long, but rewarding hunting season. I think it was sometime in the late afternoon of day three and no elk to show for our effort, that my thoughts began to turn to work and the plans we have for the American Hunting Lease Association for the 2017 and even beyond. The AHLA has all the potential, drive and inspiration to have a tremendous effect on the entire hunting landscape in the U.S. now and moving forward. But, first I had to get back home to Indianapolis for a few important meetings at the Archery Trade Association show. 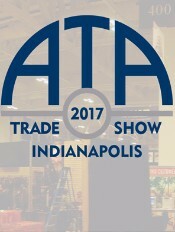 The ATA is the second largest hunting trade show in the country and brings nearly every decision maker in the hunting industry under one roof for three days. I have to be honest, when I am asked what the AHLA actually does, I have a pretty standard response that includes protecting and promoting the hunting lease concept whenever and wherever possible. My answer usually gets a bit of a blank stare back and half-hearted nod. What I really wish is that I could take everyone that has asked me that question to the meetings I had planned in Indy. Our next meeting was every bit as important and truth be told, one that I was really looking forward to. A few years ago, the AHLA (again, on your behalf) wanted to support an organization that was actively fighting for the rights of all hunters. Frankly, we are very careful about what groups we support, so after plenty of research there was one organization that really stood out. The Sportsmen’s Alliance has a long track record of standing up for the hunters and fishermen of this country. Coupled with their history of winning the battles they engage in, we felt our members would be proud to support the Alliance and would feel good to know that portions of the revenue generated from hunting lease insurance sales goes right back into the fight to keep our hunting heritage alive. It didn’t take long for our support to pay off. When the State of Illinois redefined the term “outfitter” in 2015 it inadvertently affected more commerce than intended. The result for landowners and hunters leasing land in Illinois would have been significant to say the least. Caught in the over-reaching web were hunting related websites, booking agents, hunting lease companies and even a non-profit organization working for the hunters of Illinois. The AHLA immediately reached out to the Sportsmen’s Alliance for guidance and they responded. They quickly arranged a meeting with the officials from the IDNR and the American Hunting Lease Association and even mediated the meeting. The opportunity to sit down with a government agency doesn’t come easily, but this meeting was amicable and productive from the beginning largely due to the respect the Alliance has in the industry. The issue is set to be addressed in the next legislative session. 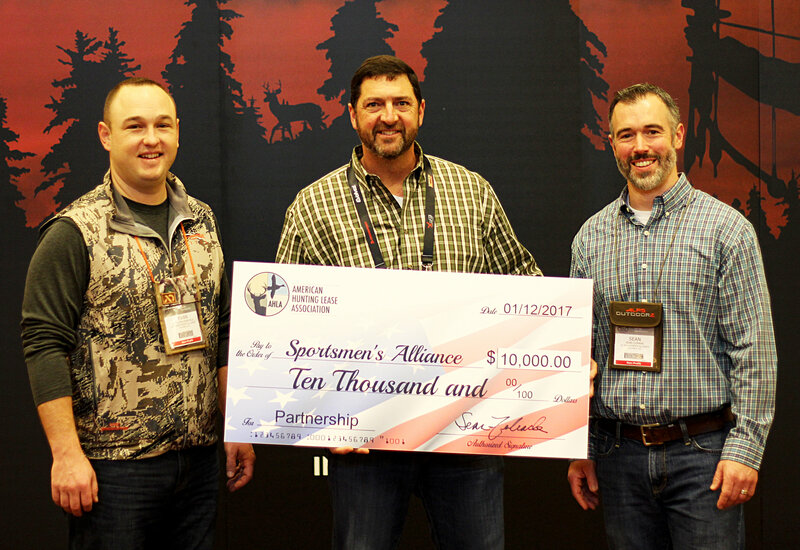 Today’s meeting at the ATA was simply to reaffirm our support and to present Sportsmen’s Alliance President Evan Heusinkveld and Vice President Sean Curran with a check on behalf of the AHLA and its members for $10,000 (our third such donation). Both Heusinkveld and Curran are hunters at heart and committed to defending hunters rights wherever needed. My third and last meeting was back with the Board of Directors of the TSSA. The sense of urgency felt by the board was heightened a couple of weeks prior when we received news from Mississippi that a 12 year old boy had died from a tree stand fall. An unthinkable tragedy that was 100% preventable. As I walked into the meeting I received a text informing me an Ohio man had fallen from his stand and was airlifted to a hospital just 24 hours earlier. I did not know his condition. Clearly there is an epidemic in our sport that must be stopped. Our meeting set a course that the entire hunting industry can follow. As your representative on the TSSA board, the AHLA will be aggressive and pro-active in making sure no hunter… young or old…doesn’t hear the message. One of the methods we will be using is social media. It may seem cliché but if you don’t already follow us on Facebook, Instagram or Twitter, please do so. We will post and share messages and stories frequently. By sharing our posts with your friends, we can begin to move the needle in the right direction. So, does the AHLA sell hunting lease insurance? Of course we do. We do it better, easier and more affordable than anyone else. But, is that who we are and all that we do? We are proud to work on your behalf every day. Whether a hunter in Alabama or Pennsylvania needs hunting lease insurance or a landowner in New York questions answered before they decide to lease their farm. It is what we do and who we are and we thank you (our members) for the opportunity to serve in that role. WE HAVE A REFERRAL PROGRAM! The American Hunting Lease Association has developed a state of the art Hunting Lease Risk Management Program. We have combined great hunting lease liability insurance (synonymous with hunt club insurance) with a proven hunting lease agreement to make your hunting experience an enjoyable one. Our program is designed to protect both the landowner and the hunters and can be purchased by either party. The master policy has many benefits over others but here are a few.